Respondent Nowella Reyes was appointed as University Treasurer of Wesleyan University of the Philippines (WUP). The new WUP Board of Trustees engaged the services of Nepomuceno Suner & Associates Accounting Firm (External Auditor) to investigate circulating rumors on alleged anomalies in the contracts entered into by petitioner and in its finances. Discovered following an audit were irregularities in the handling of petitioner’s finances, mainly, the encashment by its Treasury Department of checks issued to WUP personnel, a practice purportedly in violation of the imprest system of cash management, and the encashment of various crossed checks payable to the University Treasurer by Chinabank despite management’s intention to merely have the funds covered thereby transferred from one of petitioner’s bank accounts to another. She was terminated on the ground of loss of trust. Upon receipt of her notice of termination, respondent post-haste filed a complaint for illegal dismissal with the Arbitration Branch of the National Labor Relations Commission. She contended that the alleged crossed check issued by her payable to THE TREASURER – WUP was done in the exercise of her duty and function as such, and not with her name and not to herself and personal favor, and that said check had been prepared passing through the usual system alleging that the University heads were the beneficiaries of said amount who strongly requested that their love gift be given, hence, the encashment; and further insisted that this was the usual practice of the University and that she merely accommodated the requests of WUP personnel especially when Chinabank was already closed. Is the encashment of the crossed check proper warranting the dismissal of Reyes illegal? The encashment of the crossed check by Reyes is NOT proper. Jurisprudence has pronounced that the crossing of a check means that the check may not be encashed but only deposited in the bank. As Treasurer, respondent knew or is at least expected to be aware of and abide by this basic banking practice and commercial custom. 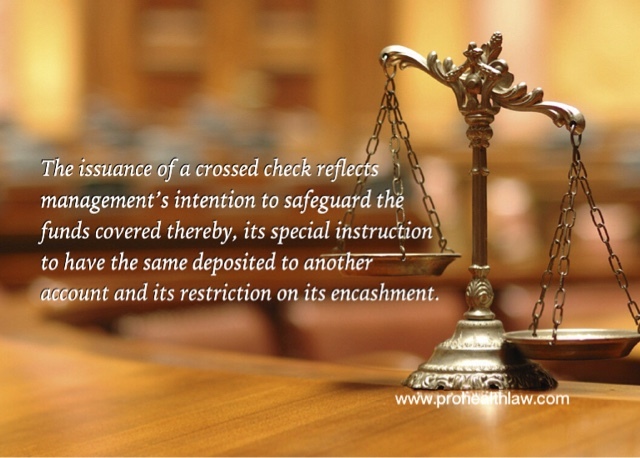 Clearly, the issuance of a crossed check reflects management’s intention to safeguard the funds covered thereby, its special instruction to have the same deposited to another account and its restriction on its encashment. Here, respondent, as aptly detailed in the auditor’s report, disregarded management’s intentions and ignored the measures in place to secure the handling of WUP’s funds. By encashing the crossed checks, respondent put the funds covered thereby under the risk of being lost, stolen, co-mingled with other funds or spent for other purposes. Furthermore, the accommodation and encashment by the Treasury Department of checks issued to WUP personnel were highly irregular. First, WUP, not being a bank, had no business encashing the checks of its personnel. More importantly, in encashing the said checks, the Treasury Department made disbursements contrary to the wishes of management because, in issuing said checks, management has made clear its intention that monies therefor would be sourced from petitioner’s deposit with Chinabank, under a specific account, and not from the cash available in the Treasury Department. That the encashment of crossed checks and payment of checks directly to WUP personnel had been the practice of the previous and present administration of petitioner is of no moment. This was simply respondent’s convenient excuse, a poorly disguised afterthought, when her unbecoming carelessness in managing WUP’s finances was exposed. The termination was therefore legal. WESLEYAN UNIVERSITY PHILIPPINES, Petitioner, vs. NOWELLA REYES, Respondent.